In order to make reward disparity make sense, this letter explains that each child gets his or her own tooth fairy. Hello! It's nice to meet you. 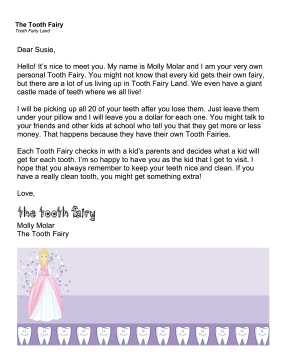 My name is Molly Molar and I am your very own personal Tooth Fairy. You might not know that every kid gets their own fairy, but there are a lot of us living up in Tooth Fairy Land. We even have a giant castle made of teeth where we all live! I will be picking up all 20 of your teeth after you lose them. Just leave them under your pillow and I will leave you a dollar for each one. You might talk to your friends and other kids at school who tell you that they get more or less money. That happens because they have their own Tooth Fairies. Each Tooth Fairy checks in with a kid's parents and decides what a kid will get for each tooth. I'm so happy to have you as the kid that I get to visit. I hope that you always remember to keep your teeth nice and clean. If you have a really clean tooth, you might get something extra!